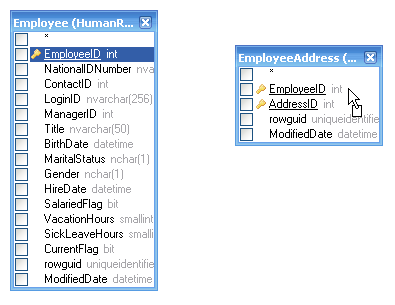 When two objects referenced with a foreign key relationship are added to the query, they become joined automatically with INNER JOIN. 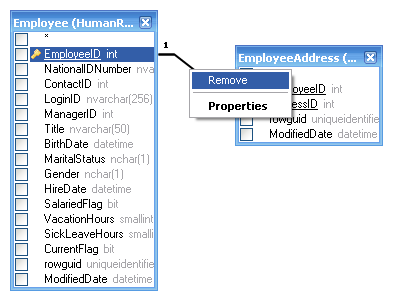 For those servers that have no support of a JOIN clause, Active Query Builder adds this condition to the WHERE part of the query. To create a link between two objects (i.e. 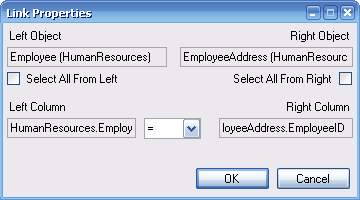 join them) manually, you should select the field by which you want to link the object with another and drag it to the corresponding field of the other object. After you finish dragging, a line connecting the linked fields will appear. Key cardinality symbols are placed at the ends of link when the corresponding relationship exists in the database. To remove a link between objects, right-click the link line and select the Remove item from the context popup menu or simply press the Delete key. The join type that is created by default is INNER JOIN, i.e. only matching records of both tables will be included in the resulting dataset. To change the join type, you can right click the link and choose the join type from "Change type" sub-menu of context popup menu. To define join the type and other link properties you can right click the link and select the Properties item from the context popup menu or double-click it to open the Link Properties dialog.